A statement recently made to me by a gracious Christian lady, firmly stated “A Christian cannot be a Democrat.” Being stunned for a moment, as I am a Christian and a Democrat, I attempted to reflect through that statement. But then as a Southern Baptist, I believe in miracles. Maybe I was that miracle of being both a Christian and a Democrat. Wow, I have received my miracle! The four-year cycle of electing a President of the United States of America is back. And each time the election season offers new and heart-cringing viewpoints. This year has been the year of pointedly questioning one’s belief in Jesus Christ in politics. Years ago I remember a street preacher from Chattanooga holding a sign up at both the national political conventions declaring that “Jesus is a Republican.” I was always fascinated how easy and cheaply one can influence the national media. A little paper and pen and you are on the news for your 15 minutes of fame. Sadly, not long after, he committed suicide because of a gender issue. In the past, Southern Baptists were Democrats. The pastors were Democrats. And there was a gentleperson’s agreement that everyone voted as a Democrat. We were not national Democrats, but Dixiecrats. We wanted to keep our democratic senator and house member, but Lyndon Johnson was a little too much for us. We must remember that the white Democrats in the south were not the leaders of the civil rights movement. Few white pastors of Southern Baptist Churches ever spoke out in support of Martin Luther King, Jr., or in support of the Civil rights movement. Not even Jimmy Carter as a state senator made any public statements in support of the march in Albany Ga., a city close to Plains, Ga. There are three principle arguments that Southern Baptists make concerning the pastor’s involvement in politics. First, there is a concern that the church could lose its federal, state and local tax exemptions. The church has been purchased for a price and it was not on Calvary. Why would the church be willing to sacrifice a message for a few pieces of gold and silver of tax money? Second, the fear of a disruption in the fellowship over political issues could bring new stress to the church. Every church has their larger supporters involved in the local politics. “Best not to get involved, preacher,” would be a common saying. “You know church and politics don’t mix.” These absurd statements are in fact in the life of the church today. It somewhat challenges the biblical mandate to preach the Word of God in its simplicity and truth. Third, Southern Baptist pastors like to be liked. We are the religious Grand Ole Opry in the pulpit. In fact, the first Grand Ole Opry building was built for an evangelist, Sam P. Jones. We are trained storytellers, we know how to end the sermon with your heart about to break, and we are going to muddle into the politics of the 99 percent of the congregation. The winks, the innuendos and the carefully tested word twitters are understood by the brethren. If you know the code, you will hear the person for whom the pastor believes you should vote. I am a Democrat. As pastor of a Southern Baptist Church, I attended the local Democratic Party meetings. I would not endorse or actively campaign for politicians. I did stress that the word politikos is a good word, and that it did matter that Christians would be active in the political process. 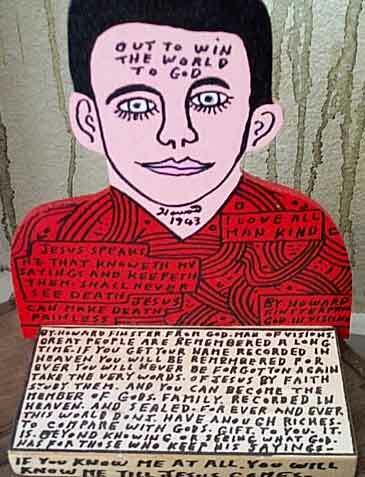 A work by the late Howard Finster, an artist and pastor who once told a reporter he knew politics very well because he was a Baptist preacher. Dr. Bruce Sloan has pastored a number of Southern Baptist churches and is currently the interim pastor of Ridgeview Baptist Church in Chattanooga, Tennessee. 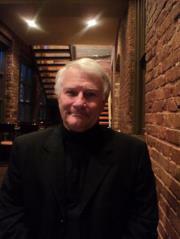 Bruce has also served as pastor of international congregations on several continents.